You read that right. 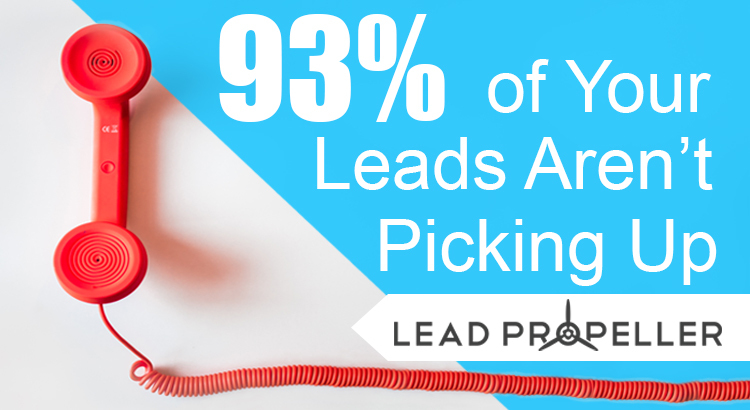 93% of your potential leads aren’t picking up the phone because you don’t have a local phone number for your real estate investing business. That’s an unacceptable number of leads that you’re losing for such a simple reason. If you thought that having an out of town area code isn’t a big deal, think again. In a case study, Software Advice found that “80% of people are extremely unlikely to pick up for an out-of-state phone number” and “13% of people are unlikely” to do the same. We’ve been over reasons why you might no be getting as many leads as you thought you would be. From marketing issues, to not having enough content, to not working on lead conversion, but the most ridiculous reason we see is by not having a local phone number for your real estate investing business. I mean – really? It’s just 3 little numbers! Those 3 little numbers in your business’s area code affect your leads more than you’d think. Like we just stated: 93% of people are unlikely or extremely unlikely to pick up the phone if you don’t have a local phone number. And frankly that’s just baffling. It makes sense, though. For starters, how many unknown out of town numbers do you pick up on your personal phone? Chances are, not that many. I know I don’t pick up too many out of town area codes that aren’t already saved in my phone. Plus, selling a house is a very stressful and emotional process. Look at it from the point of view of your customers. They’re dealing with a high stress time in their life either by having financial issues, going through a divorce, or a recent death and inheritance. Point is, the last thing these people want to do is talk to an unknown number that might be a debt collector, or tax collector, or someone from their bank. We already know that doing nothing is not a good idea. See the chart again if you’re unconvinced. Let’s move on to getting a local phone number hosted for your business, and what your options are there. For starters, the percentage of people who are likely to answer an out of town phone call is 7%. Just 7%. That’s terrible! On the other hand, the percentage of people who are likely to answer an unknown local number shoots up to 28% which is a much, much better number for your phone leads. As far as getting a third party to host a local phone number for your real estate investing business, there are a few options. Let’s go over the pros and cons! To which, people seem to think using a third party call service center is a fine solution. And, while that’s certainly a better idea than doing nothing, there are still fundamental problems with this. On the pro side, if you use a local call service your business number will have a local area code. One problem solved. On the con side, your business will have an uninformed person just there to take messages for you. Which doesn’t solve your second problem, and actually adds another. If there’s someone taking messages for you, you’ll still be the one who has to make those informed calls back to your customers. By using a local call service center, you’re relying on an operator who isn’t an expert at real estate investing to talk to your customers. Yes, it might be time saving because you’re not the one answering the phone, and sure it will have a local area code, but ultimately it harms your business. Not having a dedicated person to answer the phone who’s knowledgable in real estate investing will end up turning away 98% of your phone leads. I shouldn’t have to spell out how bad that is for business! Now we’re getting to the better options when it comes to having a local phone number for your real estate investing business. There are a few hosting places you can use, namely Grasshopper and Google Voice. Let’s go over the pros and cons of these. Pro: there’s actually a few. For these cloud hosting sites, the set up is generally pretty simple, you can text and make calls, and there’s always some kind of call tracking feature. And that’s about where the pros end. Cons: we’ll do this in 2 parts. First set of problems – problem one is most of these kinds of call hosting services will give your business an 800 number instead of a local area code. As we’ve already been over, this is the opposite of what you want. The next problem is that most of these places don’t have a way for you to personalize the message that your customers will hear if you can’t pick up for whatever reason. Not being able to customize your voice mail message is an issue. In the same call service survey, US Answer found that 80% of customers prefer a person instead of a machine, and that 72% of people are more likely to just hang up than leave a message if you don’t answer the call. So, having a robotic voice mail message that these kinds of call hosting places provide is a bad move for your real estate investing business. Now on to those “pros”. While it is nice to have your business hosted by places like Grasshopper because you can send and receive texts, remember it’s not actually coming from a local phone number. Those texts are going to be from the 800 number they randomly generate for you. In addition to that obvious problem, there’s one more. Tracking your calls with leads is important for conversion tracking, so it’s a good thing that these hosts provide a way for you to track what’s happening. But, if using a cloud host is supposed to be more convenient for you, then why would you want your phone leads tracked on a site that the rest of your data isn’t tracked on? Just like all of the other features we’ve developed specifically for your real estate investing business, you track all of your phone leads right on your dashboard. That way, you don’t have to have accounts and profiles on 10000 other websites, all you need is one! We’re all about making things simple for you to run your business and make it a success. Here’s the most exciting part, and a feature that no one else offers. By having a local number for your real estate investing business from us, your auto responses that we talked about in our last blog will be sent from the local area code that you chose. Not only will you be taking and receiving calls from a local number, but you’ll be texting with a local number as well. In a case study from last year, Franchise Help found that businesses that texted their leads had a 209% higher response rate than businesses that called their leads. That’s amazing! From that same case study, Franchise Help also found that 90% of leads prefer to text instead of call. Well, you can’t argue with numbers, and those numbers are amazing! Remember, dealing with real estate is an emotional thing for your customers. The more comfortable you can make them with communicating with you, the easier it will be to land the deal. If you know that a heavy majority of your leads prefer texting, and prefer communicating with a local phone number, then doesn’t using LeadPropeller’s local numbers feature just make sense? It makes sense to us, that’s why we made it for you! Still Think You Don’t Need a Local Phone Number for Your Real Estate Investing Business? I hope not! If my stellar writing hasn’t convinced you, at least the numbers should! But the real take away isn’t getting a local phone number, that’s a no brainer. The real lesson you should have gotten from this is that there’s a much better alternative to just getting a new number for your business. Just like all of the other features we specifically develop for real estate investors here at LeadPropeller, our local phone numbers feature is designed to be as simple for you as possible. We wanted a way for you to not only gain the trust of your motivated sellers, but to track your phone leads all in one place too. And the best part? Your new local phone number for your real estate investing business can be forwarded to any phone at any time! Let’s say you have an acquisition manager for your real estate investing business who takes care of the phones for you. You can have your new local phone number forwarded to their business phone or cell phone in seconds. And, if you decide that you’d rather be the one to take care of communicating with your motivated sellers, you can switch it back whenever you want.